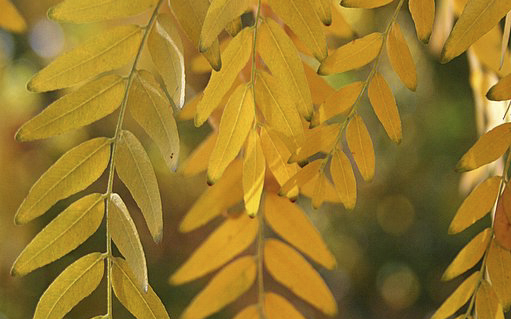 Honeylocust is a very tough and adaptable tree that is native to woodlands, pastures and fence lines of the eastern Great Plains. Thornless and fruitless varieties have been developed by the horticultural industry and are used extensively in landscaping. The trees are very hardy and are often used in parking lot islands and along sidewalks. 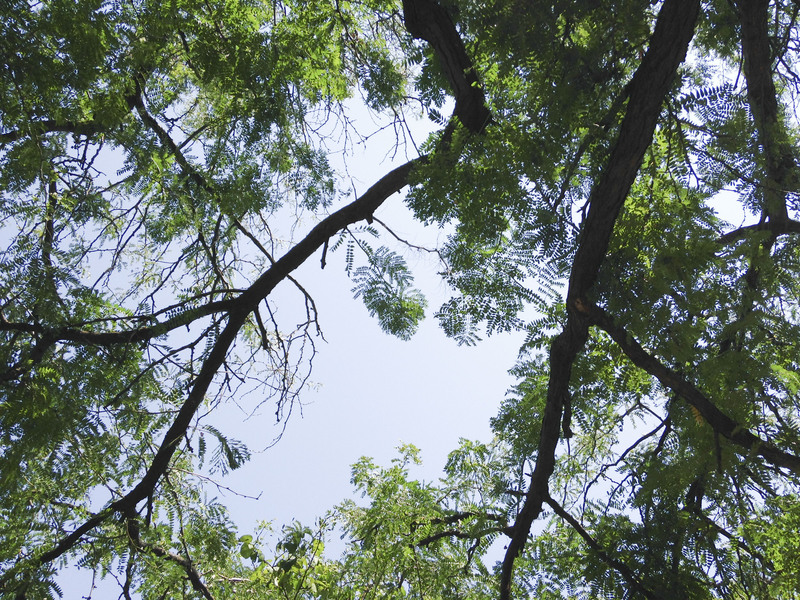 Honeylocust is amazingly tolerant of poor soils and restricted root zones making it one of the most common trees planted in downtowns and other paved areas. Suitable to plant throughout the state. Most of these trees have a very graceful, upright-arching habit and feathery compound leaves that cast a dappled shade. Wild trees are typically blessed (or cursed depending on your viewpoint) with an abundance of stout thorns and long seed pods. The seed pods contain a sweet, gummy substance that gives the tree its common name. Thankfully thornless and seedless cultivars have been developed over the years that help make this tree more desirable for landscape use. Honey locust is used extensively by wildlife. The bean pods are a favorite food of the white-tailed deer, squirrels, rabbits, hogs, opossums, and raccoons. Domestic animals such as sheep, goats, and cattle will also forage on the honey locust bean pods. Browsing and grazing animals, such as deer, cattle, and sheep utilize the tender shoots in spring and the bark of young trees in winter. Honey locust is capable of forming dense thickets of thorny vegetation which provides excellent cover for a wide variety of game animals and birds. Flowers of this species are incredibly attractive to pollinating insects. Some of the best varieties for our part of the world include ‘Northern Acclaim’, ‘Imperial’, ‘Moraine’, ‘Shademaster’ and ‘Skyline’. Honeylocust plant bugs, spider mites, leafhoppers and other insects can cause significant leaf damage in severe years. Such problems are usually cosmetic and don’t warrant insecticide treatment. Its specific epithet triacanthos is Greek and means “three-branched thorn”. Large honeylocusts in Nebraska reach up to 90 feet tall and more than 60 feet wide.